Clean your wheel's lug nuts in seconds! The Recessed Wheel Lug Nut Cleaning & Polishing Brush allows you to clean recessed lug nuts with minimal effort. The lug nut brush fits over and surrounds the lug nut and with a simple twist, brushes away brake dust and grime instantly. 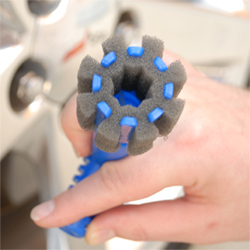 The Recessed Wheel Lug Nut Cleaning & Polishing Brush should be in every detailer's tool box! Brake dust and oily grime collects around the lug nuts on any vehicle. Before the advent of the Recessed Wheel Lug Nut Cleaning & Polishing Brush, you had to use detailing swabs to tediously clean around lug nuts. The Recessed Wheel Lug Nut Cleaning & Polishing Brush has a round foam cleaning head that surrounds the lug nut to clean it entirely with one quick motion. In literally seconds, you can completely clean all the lug nuts on one wheel. The Recessed Wheel Lug Nut Cleaning & Polishing Brush has a T handle for easy operation. Give it a twist or two to completely clean the lug nut itself and the wheel cavity. The handle is notched so you can hang the brush on the edge of your wash bucket. The Recessed Wheel Lug Nut Cleaning & Polishing Brush is made of durable plastic with a foam brush head. 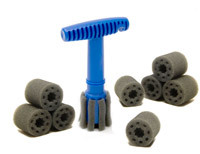 The foam is nonabrasive and the entire brush is chemical resistant. Use soapy water or a quality wheel cleaner. For the best results, use a water-based wheel cleaner suitable for all wheel types, such as Wolfgang Tire & Wheel Cleaner. Spray wheel cleaner into each lug nut cavity, insert the lug nut brush, and give it a twist. That's all it takes to remove stubborn brake dust from hard-to-clean lug nuts. The Recessed Wheel Lug Nut Cleaning & Polishing Brush cleans wheel cavities from 1 3/8 to 2 inches with lug nuts from 3/4 to 13/16 inches - the perfect size for Corvette wheels. The brush includes an extra foam cleaning head. The Recessed Wheel Lug Nut Cleaning & Polishing Brush surrounds the lug nut to clean it with one twist. The T handle is easy to operate with wet hands. Scroll Down For Money-Saving Kits! You can save even more with Recessed Wheel Lug Nut Brush Kits available at the bottom of this page. Get your brush with refills now for one low price and you'll always have a fresh foam brush head on hand when you need it! I read a lot of reviews and this seems to be a much maligned product. I was always interested so I decided to part with $11.99 and made the purchase. I actually like this product. It gets into the counterbore of the lugs and surrounds the lugnuts. It is a lot better than trying to shove a rag into the counterbore. I like it. The foam heads shrink/deform once wet leaving the ends of the plastic T-handle exposed to potentially scratch the lugs. Also, if you have longer lugs (i have a QX56 with 22" rims) I could hear the plastic on the side/font of the lugs as I rotated the handle. The foam pads are also not easy to interchange/install. I resorted to using the foam pads without the T-handle which is, at best, a 50% solution. I'm going to try the foam finger pads instead. Great concept but poor execution. 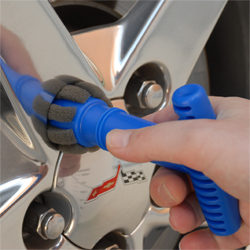 Ive been looking for a way to clean my lugnuts without busting my fingertips everytime i wash my wheels. This tool makes it so easy to get in the tight areas. Ill be getting more replacement foam for my brush and enjoy it for many washes to come. After a few uses the soft foam compresses and the hard plastic presses against the recessed part of the wheel. I had to shorten each hard plastic "spoke" of the cleaner about one quarter inch. Now it works fine on all three of my vehicles. The foam cleaning head ripped apart on FIRST use. I bought extra heads when I purchased, but have never used them. Honestly this product is junk.